Home Why Bother Growing Organic? 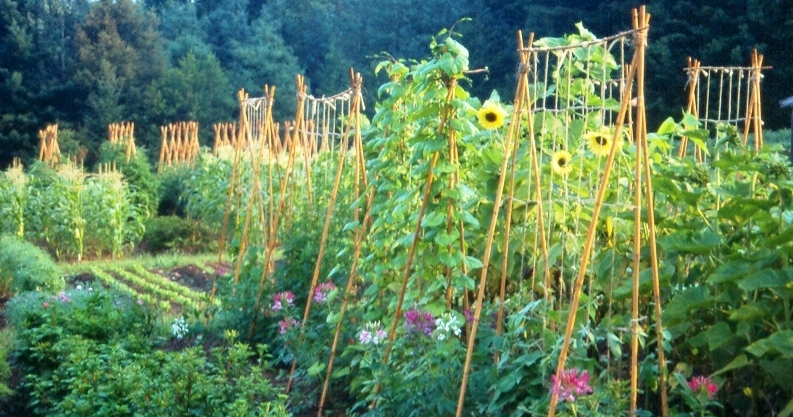 A view of The Cooks Garden organic trial gardens in Londonderry, Vermont in the 1990s. The average distance that food in the industrialized system travels before you buy it at the “local” market is ~1500 miles. This means that the “time to table” can be a week or more, even for “fresh” produce. Home grown food is also more environmentally sustainable / responsible because of all the transportation energy that is saved. Over time, that long distance food is going to get more and more expensive, too. The case is clear: if you grow it at home, and eat it at home, it is fresher and greener. The time and distance that separates you from the sources of supermarket food takes a toll on nutrition, too. Large scale growers shipping nationally have to choose vegetable varieties that stand all that handling, even if it means they have to give up something – like flavor and nutrition. And keep in mind that most of the healthy vitamins and mineral components in fresh produce begin to decline at the moment of harvest. The longer the delay from field to table, the less there is left. Even organic crops — though they start out better — suffer from the centralized, long distance shipping system. The distance fresh foods travel from farm to table in an industrialized system also affects their flavor. The chemical constituents of nutrition and flavor are similar (though genetics and growing conditions also contribute to both). Another factor is that the choice of variety also makes a difference the large growers have to choose varieties that ship well, while you can choose a variety for reasons, culinary or otherwise, that are important to you. Growing food can be a profoundly satisfying past-time; this cultural aspect is highly developed in Europe and much of the rest of the world, where the production and preparation of food is a core activity for a significant segment of the population. This is especially true for those who enjoy cooking; growing crops for the kitchen is just one more element of the culinary passion, and an expression of long-held human values. The USA is an immigrant culture, with a broad range of food traditions imported from around the world. The artisanal and the cultural motivations are especially closely related, as there are many specialized food ingredients which are impossible, difficult or expensive to obtain in the market – especially in all but the most cosmopolitan areas. But if you grow them yourself, you can control the supply that you need to fulfill your personal or cultural desires. Recognition of this fact goes beyond just the maintenance of food cultures among new immigrants; the growth of the international Slow Food movement is also evidence. Still, a lot of people these days seem to think that growing their own food is a difficult and specialized skill beyond their capability. This is especially true among those who have grown up in urban and suburban settings. Many may not even have a relative who has produced their own food, but the fact is that humans have been growing food for more than 10,000 years, and there is a broad cultural memory of how to do so that can be tapped if one slows down a bit and listens. Finally, the simple fact is that growing your own food frees you from both cultural and economic dependence on the corporate food system and gives you control over central parts of your life. Food security speaks to the economic aspect, but “food freedom” is just as important. For an in depth discussion of how local food systems operate and how they interact with nationalized, industrial food systems, see this USDA Report.